Lord of the Flies 9×6: You can’t have it both ways. What if there was an X-Files/Breaking Bad/Glee mashup? In which Breaking Bad takes over The X-Files for the second of three times. But before we get to that, I think I’ve come to a mini understanding. Doggett and Reyes as characters don’t have the comedic capabilities that Mulder and Scully did. Now, I’m more tired than anyone of hearing myself compare Doggett and Reyes to Mulder and Scully. I prepared myself for change when Season 9 first aired and I’m certainly resigned to change now. My complaint isn’t that we have a new team. No, it’s that this new team isn’t equipped to handle this kind of episode. To put it in layman’s terms, I don’t think they’re ready for this jelly. Doggett jokes around, sure. But his jokes fall flat because he sounds like an old fogey shaking his head at kids these days. There’s no point at the end of his pitard. Mulder would have delivered those very same lines with a sardonic bite that would have left me giggling. Scully would have shared knowing or appropriately horrified looks with Mulder at all the right moments, because her character knows how to play up the chaos around her to the best effect. Reyes spends most of the episode looking nothing but bemused, as if this crazed cast of characters genuinely needed the help of the F.B.I.. I know my comparisons are unfair since Mulder and Scully had time to develop a shorthand and a status quo before being thrust into the world of comedy. Yet I still find myself longing for “Humbug” (2×20) and their pitch perfect responses to the madness, and even for “Bad Blood” (5×12) when they showed us they could themselves be the madness. Frankly, despite the madness that is Dr. Rocky Bronzino, King of the Fake Bronzer, some of the better parts of this episode are watching Scully deal with him. He’s not a great character, but at least he gives Scully something to do besides pine for Mulder and worry about William. Then again, the low point of this episode is watching Dr. Scully give CPR to a man who’s already breathing. So I guess it’s a wash. The truth is, “Lord of the Flies” is confused. The basic plot is a serious X-File, but the overall tone is that of an episode of The Lone Gunmen. Why do I say that? I’m glad you asked. Sadly, The Lone Gunmen only lasted thirteen episodes, but Thomas Schnauz wrote two of them. Two good ones, I might add. A personal friend of Vince Gilligan’s from film school, he was pulled onto The X-Files after the show ended and went from there to… yep, Breaking Bad. But back to The Lone Gunmen for a moment, Dr. Rocky Branzino is a character perfectly in keeping with the over the top tone of that show. What he’s doing here in an X-File that’s also trying to be both scary and emotional is beyond me. This is a jumbled mess of goals. Is it a broad comedy? Is it a serious murder investigation? Is it a character study in teenage angst? Is it a short horror film? Is it a Twilight Zone mystery with a twist? Is it trying to be all things to all men, that it might by all means win some? Tonally, “Lord of the Flies” doesn’t know if it’s a real X-File or a light X-File. It’s possible to straddle the fence and it’s been done successfully before, but this isn’t one of those times. And if you’re going to have a comedic episode with Jane Lynch in it then she should get the chance to be funny. I’m sorry. Still on the topic of soon to be wildly famous guest stars, if you had told me that the intrepid Sky Commander Winkie would later blow my mind as Jesse Pinkman in Breaking Bad, I would have raised a Scully brow. And there’s our Breaking Bad trifecta for this episode: Vince Gilligan produced it, Thomas Schnauz wrote it and Aaron Paul starred in it. The X-Files has a long tradition of mixing puberty with the paranormal. You know the drill – your body’s going through changes and you don’t know where you fit in, so you electrocute your friend in the parking lot, have an astrological meltdown, or plow your teacher into the cafeteria wall. Or, you can turn into a B movie fly monster and cocoon your enemies, which appears to both the biological fate and freewill choice of Dylan Lokensgard. Whatever the try-hard philosophical ponderings of the closing monologue, Dylan isn’t sympathetic, or scary, or even interesting. And as such he adds nothing to the Puberty Pantheon. 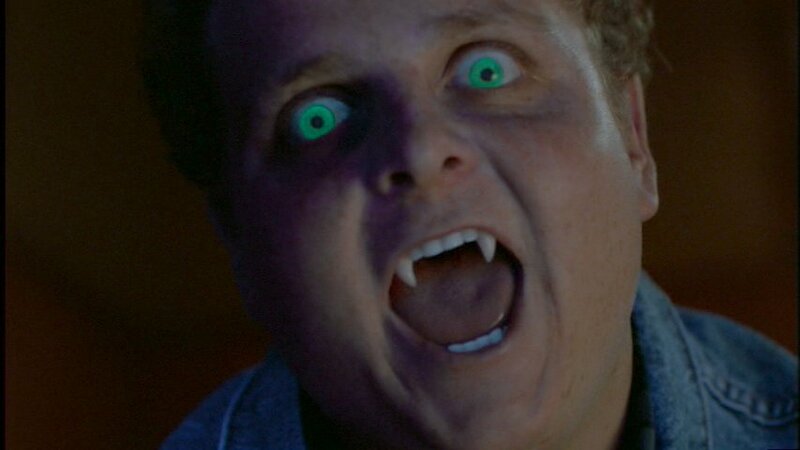 “Hungry” (7×1) was a better take on a monster who wanted to be anything but. What kind of pheromones are Mulder and Scully excreting that they keep attracting entomologists with silly names? Mothers are women too, Scully. “I’m with someone,” would have been a more definitive answer. The teenage romance doesn’t sell. It rarely does in real life either. When was the last time we had an ending voiceover/case report? 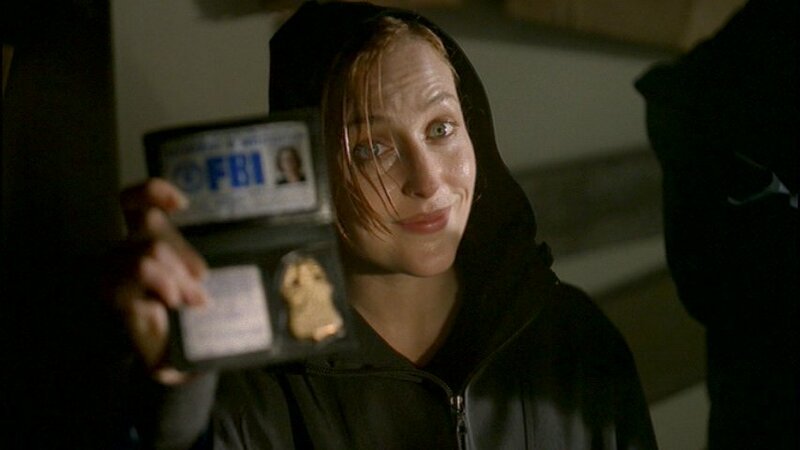 Once again, Scully is a distraction from Doggett and Reyes. Worse, she’s outshining them. I have no idea why Dylan’s little love interest suddenly feels affection toward the murderous nerd once he’s gone. No, really. Who hits on somebody by talking about shared menstrual cycles? FYI, Breaking Bad’s first takeover was “Drive” (6×2) and the next will be “John Doe” (9×7). Dr. Fountain: Well, it’s the kid’s parents. They’re suing everyone. Dr. Fountain: Everything. They’re suing the county for making the street too steep, the supermarket he stole the shopping cart from, the company that made the helmet he was wearing. Dr. Rocky Bronzino: Dr. Scully? This is so exciting. I’ve never had a partner before.